Martin described the use of endotech thermal endodontic condenser  in a warm lateral obturation method that combines the apical control of cold lateral condensation and the homogeneity of warm vertical condensation. Kersten,  when comparing the leakage of four filling technique found the endotech warm lateral produced significantly less leakage than lateral condensation. The heat can be carried to the Gutta-percha in the canal by a variety of ways included flame or electrically heated carriers like system B heat source. This device has the advantages of accurate temperature control, as well as different diameter plugger tips to accommodate a variety of canals widths. Nelson et al. found that, warm lateral condensation of Gutta-percha using system B resulted in a significant increase in density by weight when compared with standard cold lateral condensation. The aim of this study was to evaluate radiographically, the quality of root canal filling in mesiodistal and buccolingual view when comparing matched cone condensation and warm lateral Gutta-percha condensation using system B heating instrument in a low-heat warm lateral condensation technique in vitro. Forty caries free extracted human mandibular premolars teeth were used. Inclusions criteria were roots with fully formed apices, narrow apical foramina and single root canal that is patent at its apical foramen. The extracted teeth were obtained through random selection from special dental clinic. The reason for extraction was orthodontics, or periodontal disease. Teeth were stored in distal water before use. They were randomly divided into two groups of 20 each. The canal length was visually established by placing a size 15K file (Ffmm. Pneumat, France) into each root canal until the tip was visible at the apical foramen. The working length was determined to be 0.5 mm short of the apical foramen. Apical patency was maintained throughout instrumentation using size 15K file. All the root canals were instrumented using the crown-down technique with rotary Revo-S instruments (Micro-Mega, France) as instructed by the manufacture. The coronal portion of the root canal was flared using Gates-Glidden bur size 1-3. Standardized method of root canal preparation and obturation was undertaken by a single operator to reduced variation in the final result. During instrumentation, 2 ml of 1% of sodium hypochlorite (NaOCl) solution was used for irrigation between each file. The irrigant solutions were delivered via a 27-gauge needle (Ultradent, South Jordan, UT, USA) that was inserted into canal until resistance was felt. Before obturation, the teeth were irrigated with 5 ml of NaOCl, followed by 10 ml of 15% ethylenediaminetetraacetic acid solution (Meta Biomed Co., Ltd. Korea) and then a final rinse of 5 ml NaOCl to remove the smear layer. Instruments were lubricated with Endo prep gel (Terkameb Co., Ltd. Poland). After finishing the preparation, the teeth were rinsed with a distilled water to neutralize the effect of irrigant solutions that may interfere with the setting of the sealer. The root canals were dried with absorbent paper point taper 0.06 size (25) to be ready for the filling. A size (25, 0.06) taper Gutta-percha cone (Meta Biomed Co., Ltd. Korea) was tried in the canal and then trimmed if necessary to give tug back at the working length. The cone was then coated with Adseal root canal sealer (Meta Biomed, Korea) and then placed slowly into the canal to full working length. Excess Gutta-percha was removed from the canal entrance using a fine-medium system B (Sybron Endo Corp. Orange CA, USA) plugger. In this group, system B heating instrument at 101°C (the lowest setting) was used. A size (25, 0.06) Gutta-percha cone coated with Adseal root canal sealer was tried into the canal. A fine medium heat carrier tip was attached to the system B handle then the activated tip was slowly inserted into the Gutta-percha with sustained apical pressure until resistance was felt, usually to within 3-4 mm of the working length. The tip was allowed to cool for 5 s, rotated to disengage the Gutta-percha and removed from the canal. The Schilder hand spreader size 11 was immediately placed to the working length and pressed laterally against thermoplasticized Gutta-percha. Fine medium accessory cone were used to complete the obturation and excess Gutta-percha was removed with heated plastic instrument. In order, to allow the complete set of the sealer, all the specimens were wrapped in moistened gauze and stored in a sealed container at room temperature for one week. After this, each tooth in each group was radiographed mesiodistally and buccolingually [Figure 1] and [Figure 2]. To reduce variability, all specimens were prepared and filled by one operator. The method used to read the radiographic films were the visual inspection using magnifying glasses by one of the operator to avoid inters examiner variation in reading the radiographs. The quality of obturation was determined separately for apical one-third and coronal two-third of each canal for both techniques. Then data were collected for good and poor quality. Filling with good quality was characterized as a well-condensed filling that obdurate the entire canal and well adapted to the canal walls with no voids (internal or lateral). On the other hand, canal with poor quality was characterized as inadequately or poorly condensed with voids (internal or lateral). Data were collected and submitted for analysis. Statistical analysis was carried out using (Epi-info) statistical software (Centers for Disease Control and Prevention in Atlanta, Georgia, USA). F-Fisher test was used to examine the difference in quality between the two methods. P value was set at 0.05 and the level of significance at 95%. The result of this study showed no statistical significant difference in quality of root canal obturation between the single matched cone Gutta-percha filling and hot lateral Gutta-percha condensation (P > 0.05). In the apical one-third of the root canal, both techniques showed good quality canal filling in buccolingual and mesiodistal views with no statistical significant difference (P > 0.05). Although, single matched cone Gutta-percha filling produced an inferior density in the mesiodistal view with more voids especial laterally in the coronal two-third of the root canal but this was statistically insignificant (P > 0.05). The only significant difference was in single matched cone between the (buccolingual) and the (mesiodistal) in the coronal 2/3 of the root canal (P < 0.05). [Table 1] shows frequency as well as a percentage of root canal of good density of both techniques in the mesiodistal view while [ [Table 2]] shows those with good quality in buccolingual view. F-fisher test was used to examine the quality of the obturation. All statistical significance was set at (α =0.05). In the present study, the method used to evaluate the quality of root canal obturation is the visual inspection of the obturation material by the use of radiographs. Radiographic studies have a number of limitations imposed by the orientation of the tooth and the angulations of the X-ray beam which can result in an acceptable radiograph appearance of a poorly condensed or adapted root filling. Clinical assessment of root fillings is restricted to the use of radiographs, usually in the buccolingual plain; in this study radiograph were taken into planes (buccolingual and mesiodistal) in order to provide a better reflection of the quality of the obturation and to overcome the limitation of the radiograph. Whole extracted teeth were used in our study to improve the reliability of the investigation by simulating the clinical situation. Smear layer were removed because many studies have suggested that thermoplasticized Gutta-percha can adapted better to prepared dentin. Despite the lack of evidence, it is generally accepted that the volume of Gutta-percha should be maximized and the volume of sealer should be minimized within the root canal. The single-cone technique consists of a single Gutta-percha cone filled at room temperature with sealer layer thickness that varies, depending on the adaptation of a single cone to the canal walls. Single cone obturation has not been well-regarded because of the use of large amounts of sealer; porosities in large volume of sealer, setting contraction and dissolution of the sealer are the main disadvantages of the technique. With the widespread use of the rotary NiTi instruments, matched-taper Gutta-percha cones developed and the single-cone technique has become popular again. 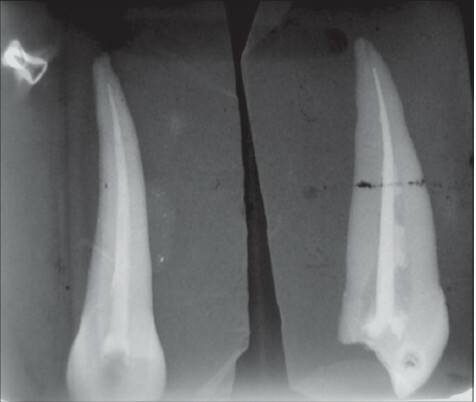 In the present study, single matched cone produce a denser fill as that of the hot lateral technique especially in the apical one-third of the root canal. This result is expected because the purpose of heat component used in hot lateral is only to thermo soften the Gutta-percha, not to remove the bulk of it, then to condense it laterally. A root canal filling should prevent the penetration of micro-organisms via root canal into the periradicular tissues and block the portal exit to the periapex for the organisms that, even after instrumentation and disinfection have survived. Occasionally, there are voids in the root filling. Voids inside filling materials (internal voids) could be consider less clinically relevant because bacteria, if present, confined in an unfavorable environment. Voids along the canal walls (external and combined voids) are caused by the presence of a gap between the filling material and dentinal walls and may jeopardize the outcome, because they are in contact with potentially infected canal walls. Furthermore, they represent a gap that may promote the failure of the sealer to leakage. In this study, internal voids were present more in hot lateral technique especially in the coronal two-third of the canal [Figure 1]. This was due to entrapment of air between the increments of Gutta-percha. While lateral voids present more in single matched cone especially in the coronal two-third of the canal in the mesiodistal view [Figure 2]. This is the first investigation between hot lateral condensation and single-matched cone Gutta-percha obturation using the radiograph. System B, has recently gained popularity as the heating instrument of choice for Buchanan's continuous wave of condensation. Although advocated for warm vertical condensation, its use in a warm lateral condensation has a merit. A temperature of 101°C, which is the lowest setting available in system B, was used instead of 200°C recommended in warm vertical technique. Nelson et al. compared quantitatively the density of stander cold lateral condensation and warm lateral condensation using system B heating instrument in a lower heat and he weighed the blokes before and after obturation, he found that warm lateral condensation of Gutta-percha using system B resulted in a significant increase in density by weight when compared with stander cold lateral condensation. Mckissock et al. used the leakage test to compare in vitro the sealing ability of continuous wave of condensation technique and the sealing ability of single cone technique. He found that, the active Gutta-percha glass-ionomer-based single-cone obturation technique demonstrated statistically significant higher leakage rates than a continuous weave of condensation. Tasdamire et al. 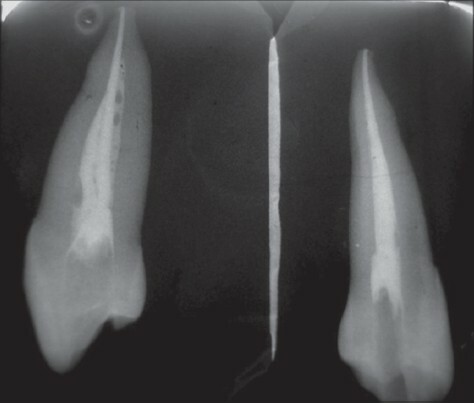 compared the percentage of Gutta-percha filled area in the apical third of root canals after filling with single cone technique and cold lateral condensation. He reported that, single-cone technique yielded significant higher percentage Gutta-percha filled area than lateral condensation (P = 0.046) at 2 mm level. At 4 mm level, the percentage Gutta-percha filled area was greater with lateral condensation but this difference was not significant. Inan et al. reported that, the results of matched taper single cone obturation was comparable with those of lateral condensation and thermafil technique in terms of apical seal using fluid infiltration methods. These results are in agreement of our study, single matched cone technique produce a denser fill of Gutta-percha as that of hot lateral technique with no significant difference (P > 0.05) in apical 1/3 of the root canal in both views. Within the limitation of this study single matched cone technique has a good density in the apical one-third as that of the hot lateral so it may be used for filling narrow canals. Matched cone showed inferior density in the coronal two-third of the root canal that can be improved by using accessory cones Gutta-percha in wide canal. Single matched cone technique is simple and may be indicated in round canal teeth. 1. Economides N, Kokorikos I, Kolokouris I, Panagiotis B, Gogos C. Comparative study of apical sealing ability of a new resin-based root canal sealer. J Endod 2004;30:403-5. 2. Jarrett IS, Marx D, Covey D, Karmazin M, Lavin M, Gound T. Percentage of canals filled in apical cross sections: An in vitro study of seven obturation techniques. Int Endod J 2004;37:392-8. 3. Sundqvist G, Figdor D, Persson S, Sjögren U. Microbiologic analysis of teeth with failed endodontic treatment and the outcome of conservative re-treatment. Oral Surg Oral Med Oral Pathol Oral Radiol Endod 1998;85:86-93. 4. Wu MK, van der Sluis LW, Wesselink PR. A 1-year follow-up study on leakage of single-cone fillings with RoekoRSA sealer. Oral Surg Oral Med Oral Pathol Oral Radiol Endod 2006;101:662-7. 6. Park H. A comparison of Greater Taper files, ProFiles, and stainless steel files to shape curved root canals. Oral Surg Oral Med Oral Pathol Oral Radiol Endod 2001;91:715-8. 7. Schäfer E, Vlassis M. Comparative investigation of two rotary nickel-titanium instruments: ProTaper versus RaCe. Part 1. Shaping ability in simulated curved canals. Int Endod J 2004;37:229-38. 8. Taºdemir T, Aydemir H, Inan U, Unal O. Canal preparation with Hero 642 rotary Ni-Ti instruments compared with stainless steel hand K-file assessed using computed tomography. Int Endod J 2005;38:402-8. 9. Qualtrough AJ, Whitworth JM, Dummer PM. Preclinical endodontology: An international comparison. Int Endod J 1999;32:406-14. 10. Dummer PM. Root canal filling. In: Ford TR, editor. Harty's Endodontics in Clinical Practice. 5 th ed. Edinburgh, UK: Wright; 2004. p. 113-36. 11. Clinton K, Van Himel T. Comparison of a warm Gutta-percha obturation technique and lateral condensation. J Endod 2001;27:692-5. 12. Schäfer E, Olthoff G. Effect of three different sealers on the sealing ability of both thermafil obturators and cold laterally compacted Gutta-Percha. J Endod 2002;28:638-42. 13. Lertchirakarn V, Palamara JE, Messer HH. Load and strain during lateral condensation and vertical root fracture. J Endod 1999;25:99-104. 14. Schilder H. Filling root canals in three dimensions. Dent Clin North Am 1967;11:723-44. 15. Wollard RR, Brough SO, Maggio J, Seltzer S. Scanning electron microscopic examination of root canal filling materials. J Endod 1976;2:98-110. 16. Wilson BL, Baumgartner JC. Comparison of spreader penetration during lateral compaction of. 04 and. 02 tapered Gutta-percha. J Endod 2003;29:828-31. 17. Gordon MP, Love RM, Chandler NP. An evaluation of. 06 tapered Gutta-percha cones for filling of. 06 taper prepared curved root canals. Int Endod J 2005;38:87-96. 18. Kardon BP, Kuttler S, Hardigan P, Dorn SO. An in vitro evaluation of the sealing ability of a new root-canal-obturation system. J Endod 2003;29:658-61. 19. Martin H: Caulk Endotec, thermal endodontic condenser system. The warm lateral condensation technique. Clinical manual. Milford: Dentsply International Inc., 1987:1. 20. Kersten HW. Evaluation of three thermoplasticized Gutta-percha filling techniques using a leakage model in vitro. Int Endod J 1988;21:353-60. 21. Nelson EA, Liewehr FR, West LA. Increased density of Gutta-percha using a controlled heat instrument with lateral condensation. J Endod 2000;26:748-50. 22. Kersten HW, Wesselink PR, Thoden van Velzen SK. The diagnostic reliability of the buccal radiograph after root canal filling. Int Endod J 1987;20:20-4. 23. Wu MK, van der Sluis LW, Wesselink PR. A preliminary study of the percentage of Gutta-percha-filled area in the apical canal filled with vertically compacted warm Gutta-percha. Int Endod J 2002;35:527-35. 24. Saunders EM, Saunders WP. Long-term coronal leakage of JS Quickfill root fillings with Sealapex and Apexit sealers. Endod Dent Traumatol 1995;11:181-5. 25. Buchanan LS. The continuous wave of obturation technique: 'centered' condensation of warm Gutta-percha in 12 seconds. Dent Today 1996;15:60-2,64. 26. McKissock AJ, Mines P, Sweet MB, Klyn SL. Ten-month in vitro leakage study of a single-cone obturation system. US Army Med Dep J 2011;Jan-Mar:42-7. 27. Tasdemir T, Yesilyurt C, Ceyhanli KT, Celik D, Er K. Evaluation of apical filling after root canal filling by 2 different techniques. J Can Dent Assoc 2009;75:201a-d.
28. Inan U, Aydin C, Tunca YM, Basak F. In vitro evaluation of matched-taper single-cone obturation with a fluid filtration method. J Can Dent Assoc 2009;75:123-6.